C.D.R.G. (AUSTRALIA)©: Private Independent Investigation and Research Group; Cosmic-Celtic Shamanism, Alchemy, Druidry, Metaphysics | SACRED EARTH PRACTICES©: Wholistic Health, Environmental-Energy Medicine, Shamanic Healing/Soul-Retrieval | CSETI AUSTRALIA©: Advanced ET Contact, Cosmic Awareness 5D∞; UFOlogy; Ambassador to the Universe [CSETI Advanced Training] | KAY MAREE McCULLOCK N.D.: unique Processes, Modalities, Mentoring, Expeditions, Conferences, Public Speaking and Expos. About C.D.R.G. 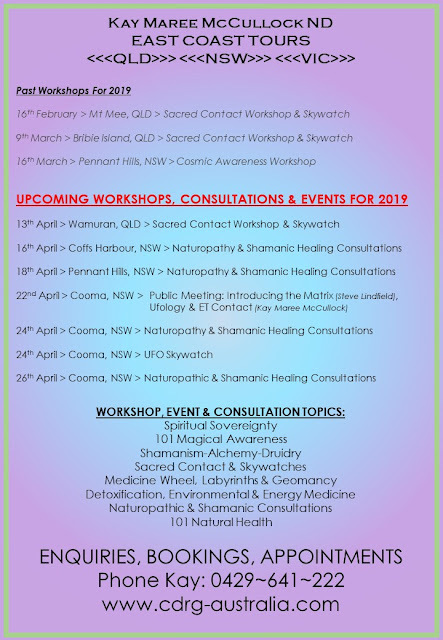 (Australia) & Kay Maree McCullock N.D.
To Attend Any of Our Skywatch Events, You Will Need To Register With us Via Email. Some Our Events Are Pubic Or Private OR Invite Only, And Some Will Be Free Or By Donation and Others Will Have A Small Fee. We Are Incorporating Other ET Contact Techniques To Complement The Already Proven CSETI Protocols and Techniques. A New, Adventurous And Exciting Year Ahead !!!! Please see page "About C.D.R.G." and "About CSETI" for more detailed info. *****ALL INFORMATION ON THIS BLOG IS COPYRIGHT OF Kay McCullock ND, C.D.R.G. (Australia) and CSETI Australia. DO NOT REPRODUCE WITHOUT PRIOR CONSENT. ALL RIGHTS RESERVED***** If you wish to share any information on here you Must Email Us For Permission First. We are Happy for You to Share with Others but not to Take our Information and Use and Alter It For Your Website (as some other people have!). All content of this Blog is Copyright of C.D.R.G. (Australia). Email for permission to use. Awesome Inc. theme. Theme images by sololos. Powered by Blogger.